A memorial service was held in Romania on Monday on the anniversary of the Yasur helicopter crash that occurred during a training exercise. A delegation of senior Israeli Air Force officers, Defense Ministry representatives, IDF rabbinate officials, as well as family members and friends attended the event. The delegation was headed by IAF Chief Major-General Ido Nehushtan. During the two day visit, the delegation will hold a memorial service at a monument erected in memory of the fallen soldiers near the site of the crash in the Carpathian Mountains. On July 26, 2010, a military helicopter carrying six Israeli soldiers and one Romanian crashed in mountainous terrain near Brasov, in central Romania. Lt. Col (Res.) Avner Goldman; Lt. Col. Daniel Shipenbauer; Maj. Yahel Keshet; Maj. Lior Shai; Lt. Nir Lakrif and Sergeant 1st Class Oren Cohen lost their lives in the accident. Romanian Air Force officer Captain Stefan-Claudiu Dragnea was also killed in the incident. During the memorial service, the delegation unveiled a monument in memory of the fallen soldiers. 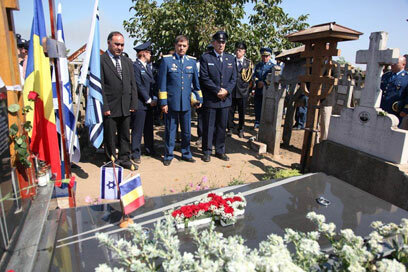 See all talkbacks "Romania: Fallen IDF soldiers Remembered"